One Step Closer To Collective Bargaining, Some Temp Workers Unionize The labor board broadened the definition of joint employers — allowing temps, including many who are in the country illegally, to organize. But those immigrants face extra risk if bosses retaliate. 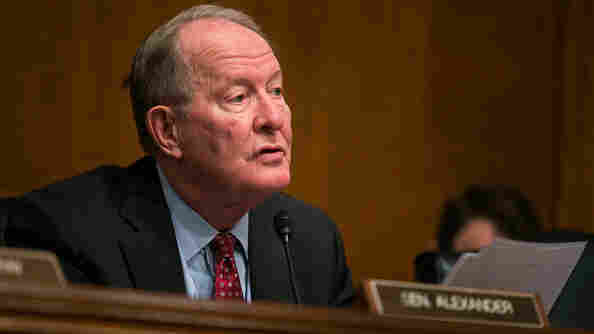 Senate Health, Education, Labor, and Pensions Committee Chairman Lamar Alexander, R-Tenn., makes opening statements during a hearing to examine the National Labor Relations Board's joint employer decision last month. Advocates for temporary workers are celebrating a decision by the National Labor Relations Board to broaden the definition of joint employers — a move that could bring many temp workers closer to collective bargaining. 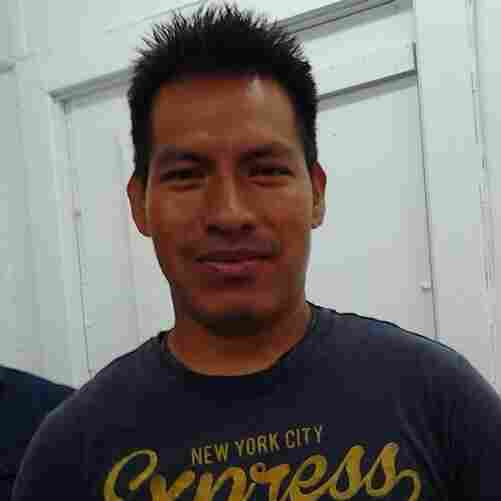 One of the first to join a union following the new rule is a group of Guatemalans in New Bedford, Mass. Arriving from all over New England and New York, a fleet of trucks delivers endless loads of spent rubber to the New Bedford tire yard. A shredder feeds a conveyor belt that spits onto a mountain as black as coal, destined to be reused as heating fuel. Tomas Ventura, 26, has worked at Bob's since he came to the U.S. from Guatemala at the age of 18. "Basically, they treated us poorly. And so in January, we got together and asked for a dollar raise. Our boss said he'd give it to us in April, but time passed and we never got our raise," Ventura says. Ventura says most of the workers get no paid sick leave or vacation time — and after eight years working for the company, he earns $11 an hour. Bob's Tire Co. refused to comment for this story. But by Ventura's account, earlier this year the owner of the company fired him and three others for demanding better wages. Tomas Ventura says that after his boss treated him — and other workers — poorly, he returned to protest. Thanks to a change in federal labor law, it's easier for temp workers like Ventura to unionize. "I think he fired us to teach the other workers a lesson. That's why I said, 'Let's do something. This is the time,' " Ventura says. Ventura says they returned to protest, threatening to file a grievance and pressuring the company to rehire them. Late last month, shortly after the four workers were rehired, 65 of 70 workers voted to join the United Food and Commercial Workers union. According to the census, New Bedford is home to 1,500 Guatemalans, though advocates estimate the real number could be three times that. The ones at Bob's Tire speak a Mayan language, K'iche', and at least some say they're in the U.S. illegally. Former National Labor Relations Board Chairwoman Wilma Liebman says workers in the country illegally have the same rights under labor law as citizens — but there's a wrinkle. "What that means it is that undocumented workers who are involved in an organizing effort risk, if they are fired, [they are not] able to get their job back and [not] able to get back pay for the time that they've been fired," Liebman says. Organizers in New Bedford estimate as many as three-quarters of the city's Guatemalans are here illegally — and the majority work through temp agencies. That's probably the case in other parts of the country as well. Advocates say it's a common way companies avoid liability for employing such workers. The change in federal labor law could make it easier for temp workers to unionize, whether they're here illegally or not. The Bob's Tire workers unionized as employees of both the tire company and the temp agency. Attorney Michael Harper, who teaches labor law at Boston University, says this would have been hard to do before the NLRB changed the definition of joint employment. "Oh, your employees formed a union, a temp agency? We're going cut you off. They're out of a job because they formed a union. Now, if they're a joint employer, if they do that, that's an unfair labor practice," Harper says. Opponents of the decision on joint employment say it will subject companies to strikes, boycotts and pickets that were previously unlawful, as well as liability for unfair labor practices. Stephen Dwyer, general counsel at the American Staffing Association, a trade group that represents temp agencies, says temp workers are so mobile he doesn't expect it to have much impact. But he says it's already causing confusion over what entities can be considered joint employers. "The business community and the employee community needs to be able to rely on established legal precedent, and when there is a moving target in terms of what that standard is, it creates confusion," Dwyer says. The NLRB decision might not change much nationwide, but it could have big implications in New Bedford and places like it around the country.